Robert Blagojevich gets some welcome news: The Government is dropping its case against him and won't be refiling charges. Assistant U.S. Atty. Reid Schar said the government was dropping two counts of extortion conspiracy and one count each of wire fraud and extortion because of "the disparity in the roles" of the two brothers and "in the interests of justice." I'm glad the Government made the right call, see my post, Enough about Rod, Lets Talk About Robert. Former Illinois Governor Rod Blagojevich has embarked on a new round of media interviews. He's everywhere from the morning news shows and radio to Fox News Sunday (tomorrow morning) proclaiming his innocence and protesting his persecution at the hands of U.S. Attorney Patrick Fitzgerald. Here's the transcript of yesterday's Today Show appearance. John Dean has a trial post-mortem at Findlaw. He makes the same points I did during the trial and jury deliberations, but much more succinctly and in one place. It's a good read. Shorter version: The Government overcharged Blago, presented a needlessly complex case and hopelessly confused the jurors. 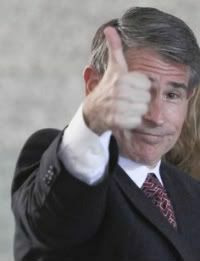 No one knows what the jury is thinking, but in the court of public opinion, according to The New York Times, the tide is turning in favor of former Illinois Governor Rod Blagojevich.